The Pies’ will embark on a variety community visits and camps throughout Australia in the coming week. Our players and staff will travel to Tennant Creek, Sale, Oakleigh and a number of country towns to visit schools, local clubs, nursing homes and run super clinics whilst promoting healthy lifestyles and leadership through football. The visits will begin with the Pies’ heading to country regions in conjunction with AFL Victoria. “On Wednesday we have groups of players travelling by buses, cars and light aircrafts heading to Orbost (east coast), Yarra Glen, Broadford, Horsham, Phillip Island and Wangaratta for the day, visiting schools’ kids around the state,” Community Manager Liz Ryan explained. “This leads into our Community Camp starting on Sunday with 15 staff and players heading up to Barkly, Northern Territory. “35 staff and players depart for to Sale in the Latrobe Valley, while 12 players will reach out to our Next Generation Academy metro zone of Oakleigh on Monday and Tuesday week. “These visits and camps will have amazing reach not just across the state but around the country, highlighting our Community values strongly." Darcy Moore, Nathan Murphy, Tom Phillips, Anton Tohill and Academy Coach Tarkyn Lockyer will board a plane and venture to a remote area of Tennant Creek in the Northern Territory. The town is 500km north of Alice Springs and falls in Collingwood’s Next Generation Academy region of Barkly. In 2017 the club launched the academy designed to grow AFL in the region and encourage inclusiveness and cultural diversity throughout the channels of football. 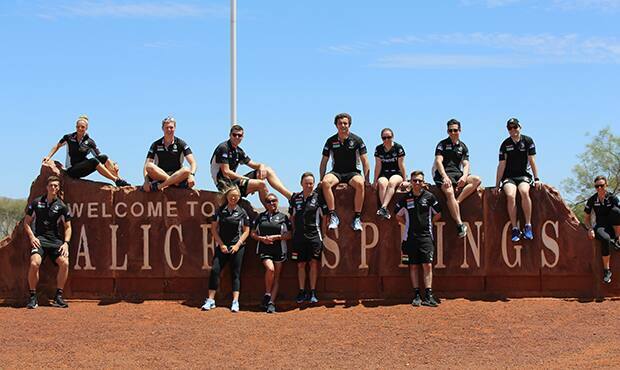 The opportunity to have players visit Tennant Creek is certainly one that is an exciting experience for all involved. “These visits and camps will have amazing reach not just across the state but around the country, highlighting our Community values strongly,” Ryan explained. The community component to Collingwood’s pre-season will continue through to the JLT Series where the club will play in Joondalup, Western Australia and Morwell in Victoria’s Gippsland.